It seems you liked it a bit more than I did. 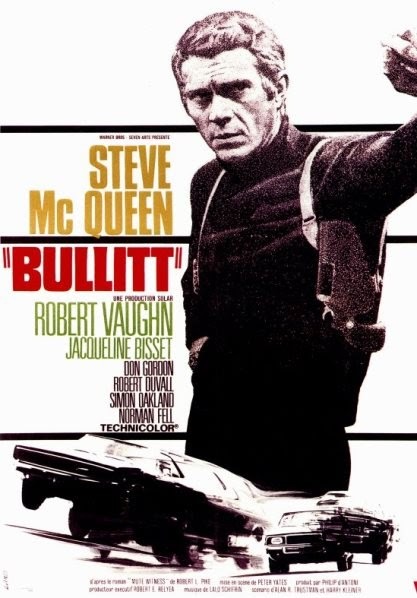 Does have a strong performance by Steve McQueen, though the story didn't leave a lasting impression on me, besides the car chase. I probably need to see it again, to give it its due. Good review. Thanks Chris. Though I didn't speak about the film's weaknesses, on the whole I did like it. Yes, do give it another try sometime. Excellent review of a film that is now regarded as a classic of its kind, featuring what is considered the most iconic cinematic chase sequence ever. But of course you say as much yourself at the outset. And yes, Lalo Schifrin exceptional jazz score is a standalone! Thanks Sam. This is the kind of film that one can sit back & enjoy any given day. The fact that it became a trendsetter in the police procedural sub-genre adds more cookies to its basket. Shubhajit, mainstream Hollywood movies seem rather out of place on this site, i think you should just stay with reveiwing the highbrow eletist stuff. Whoever said that a film can be good only if its "highbrow" & "elitist"? Even the likes of Godfathrer, Gold Rush, etc. were mainstream films, and very good films too. I didn`t realise that you actually do genuinely like Hollywood blockbusters my old mate, its just that some sites are totally contemptuous of the Hollywood product, "Strickly Film School" for instance, they wouldn`t reveiw a Michael Bay movie if their lives depended on it ! ! !. I love good cinema Teddy, and it doesn't matter if its an obscure, cerebral, languidly-paced, bleak East European arthouse film or a hyper-kinetic, muscular, testosterone-fuelled & gripping Hollywood movie. In fact, if you go through my site, you'll find loads of American films (including the mainstream ones & old classics) reviewed in it. Only that I don't watch anything & everything thrown at us by Holly anymore - I've become quite selective at that.